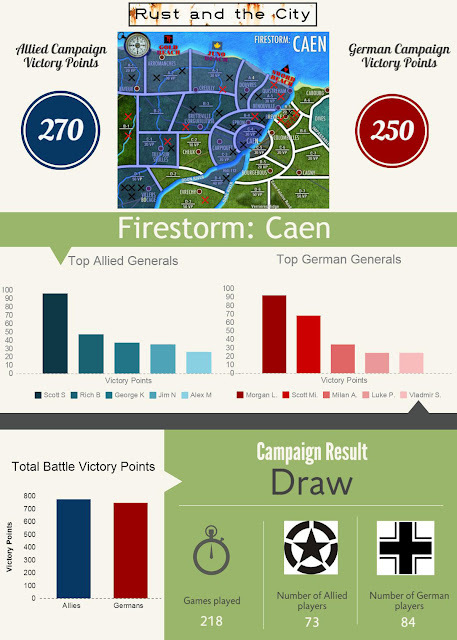 After two months of bloody battles across three continents, the global Firestorm: Caen campaign has finally come to an end. In this blog post I will summarize the campaign and announce the final victory points for both sides. I'll also recap the total players from each side and the top Generals for the German and Allied forces. First off, I want to heartily thank everyone who participated in the campaign. It was amazing to see the number of people who participated from all over the world. In total, we had 218 games played in the campaign! We had approximately 84 German players and 73 Allied players (some people played both sides, a few may have been counted twice). At the outset of the campaign I was hoping that we would just have enough results to complete each area. The campaign was a catalyst for many different events as people participated in different ways. The majority of results were from Flames of War games but we also had some contributions from Bolt Action and Chain of Command players. 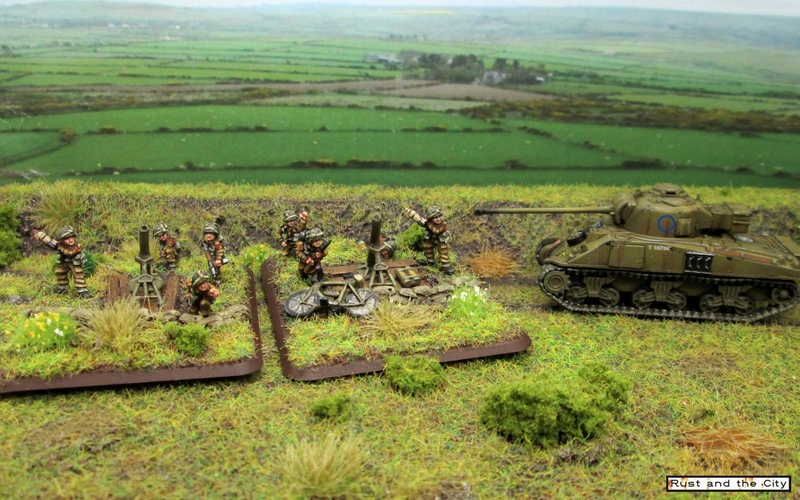 In addition to standard games, we had multi-player games, mini tournaments, game days, two player games, and a massive game in Montreal, Canada for Villers Bocage. It was really neat to see people fit the campaign game into the way they wanted to experience the games. You can see all of the campaign progress by clicking on the Firestorm Caen tag. Patrick G. from New Zealand was the lucky winner of the final Battlefront plastic box set! The campaign map at the end of the campaign. Blue represents Allied territory. Red crosses are German victories and black crosses are Allied victories. The campaign was incredibly close overall. Over the course of 218 games, the Allies have a slight lead in battle Victory Points with 773 to the Germans’ 745. It is pretty interesting to see how close the results are between the two sides over the course of so many games. The Allies had a slight edge in the victory points which may be due to the slight edge in Firestorm Troops over the campaign (or superior players… or simply random variance…). I used Piktochart to make this fun campaign infographic. When the dust settled, the Allies were in control of 13 territories and had accumulated a total of 270 campaign victory points. The German forces managed to hold onto 13 territories and had a total of 250 campaign victory points (30 from destroying three surrounded Firestorm Troops at Sword Beach). 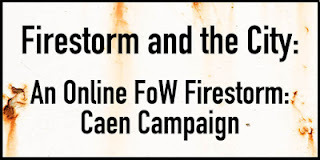 According to the Firestorm: Caen document, this final result is a draw. 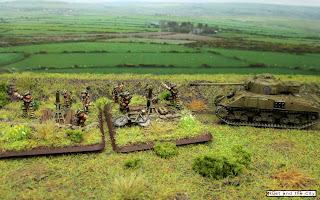 While the Allies have finally built a solid base of support in Normandy, the German forces have delayed the advance enough for the battle to drag out into a bitter stalemate. Morgan L. has kindly compiled some statistics on the top generals for the Allied and German sides. He has tallied up the total victory points for each of the generals (not average). Here I have shared the top five commanders from each side of the campaign. There may be some small errors due to mistakes in typing up the results. I apologize if there are. The top Allied general was Scott S. with 96 total victory points. The top five Allied generals also included Rich B., George K, Jim N, and Alex M. The top German general was Morgan L. with 92 victory points. The top five German generals also included Scott Mi., Milan A., Luke P., and Vladmir S.
Lastly, there are many people I need to thank for making this campaign such a big success. Thank you to Battlefront for providing prize support for the campaign. Thank you to Sean for being the dedicated and flexible German commander. Thanks to Jokull for writing the excellent and professional campaign. Thanks to Morgan L. for helping out with compiling some of the campaign data. Last of all, thank you to all of the players who contributed results, ideas, pictures, blog posts, podcasts, battle reports and enthusiasm to the campaign. It has been both challenging and rewarding running this campaign. There are already some rough plans forming for a second campaign in the Fall of 2016. There is a poll on the Facebook group for a preferred campaign setting for the next campaign. You can also leave any feedback and campaign settings and ideas in the comments below. Thank you to everyone who has followed along, participated, and commented along the way. What would you like to see in a future online campaign? Post your thoughts in the comments below! Thanks Richard. It was a lot of fun. Glad you enjoyed it. Any ideas for the next one? Thanks for running the campaign Cam! I wish I had of been able to play more games hopefully next time. Thanks for being the German general. I think you did a great job of slowing the Allied advance in key locations. Hopefully we can play a game against each other sometime soon! Firestorm Market Garden would be a cool progression perhaps? It would fit nicely that way. Market Garden is a nice fit because Germans, British, Poles, and Americans are all involved in it. One downside is the German lists for Market Garden are pretty restrictive. Ha-ha, yes. A company of 88s would be fun. Now the MidWar lists got their tiny update, perhaps a North Africa or Eastern Front campaign? I thought about that too. The concern for most seems to be not enough people having Soviet lists. It's still definitely to be decided.